Health Tips From The Professor Is Omega-3 Uptake Gender Specific? Homecurrent health articlesIs Omega-3 Uptake Gender Specific? Is Omega-3 Uptake Gender Specific? Do We Need To Reexamine Everything We Thought We Knew About Omega-3s? Some of you may remember the book from a few years ago titled “Men are from Mars, Women are from Venus”. The book proposed that men and women communicate differently (Who would have guessed? ), and understanding that fact would help husbands and wives communicate with each other more effectively. I know that some people complained that it was an overly simplistic viewpoint, but I know it sure helped me communicate more effectively with my wife. I came across a very interesting article recently that suggested the omega-3 fatty acid EPA might be metabolized and utilized differently by men and women. You might say that the statement “Men are from Mars, Women are from Venus” applies to omega-3 utilization as well. Omega-3s reduce the stickiness of platelets so that platelet aggregation, a fancy name for blood clotting, occurs less readily. Of course, we want our blood to clot when we cut ourselves, but we don’t want it to clot inside our arteries, because that is the very process that can lead to heart attacks and stroke. Omega-3s lower triglycerides and reduce inflammation, two important risk factors for heart disease. Omega-3s help keep the walls of our blood vessels elastic, which enhances blood flow and reduces the risk of hypertension. However, for any of those things to occur, the omega-3 fatty acids must first be incorporated into our cell membranes. Thus, it is not just how much omega-3s we get in our diet that is important. We need to know how many of those omega-3s are actually incorporated into our membranes. What if the efficiency of omega-3 uptake into cellular membranes were different for men and women? That would change everything. 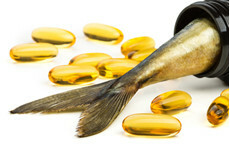 It would affect the design of omega-3 clinical studies. It would affect omega-3 dietary recommendations for men and women. The implications of gender-specific uptake of omega-3s would be far reaching. The authors of this week’s study (Pipingas et al., Nutrients, 6, 1956-1970, 2014) hypothesized that efficiency of omega-3 uptake might differ in men and women. They enrolled 160 participants in the study (47% male and 53& female) with an average age of 59 years. The study excluded anybody with pre-existing diabetes or heart disease and anybody who was significantly overweight. The study also excluded anyone taking drugs that might mask the effects of the omega-3 fatty acids and anybody who had previously consumed fish oil supplements or more than two servings of seafood per week. This was a complex study. In this review I will focus only on the portion of the study relevant to the gender specificity of omega-3 uptake. For that portion of the study, both male and female participants were divided into three groups. The first group received 3 gm of fish oil (240 mg EPA and 240 mg DHA); the second group received 6 gm of fish oil (480 mg EPA and 480 mg of DHA); and the third group received sunflower seed oil as a placebo. The study lasted 16 weeks, and the incorporation of omega-3 fatty acids into red blood cell membranes was measured at the beginning of the study and at the end of 16 weeks. A dose specific increase in EPA incorporation into red cell membranes compared to placebo. That simply means the amount of EPA that ended up in the red blood cell membrane was greater when the participants consumed 6 gm of fish oil than when they consumed 3 gm of fish oil. Very little incorporation of DHA into red blood cell membranes was seen at either dose. This was not unexpected. Previous studies have shown that EPA is preferentially incorporated into red cell membranes. Other tissues, such a neural tissue, preferentially incorporate DHA into their membranes. The efficiency of EPA incorporation into red cell membranes compared to placebo was greater for women than for men. In women increased EPA uptake into red cell membranes was seen with both 3 gm and 6 gm of fish oil. Whereas, with men increased EPA incorporation into red cell membranes was only seen at with 6 gm of fish oil. What Is The Significance Of These Observations? It was a very small study. Obviously, this study needs to be repeated with a much larger cohort of men and women. This study was just looking at incorporation of omega-3s into red cell membranes. We don’t yet know whether the specificity of omega-3 uptake will be the same for other tissues. Nor do we know whether there will be gender specificity in the biological effects of omega-3s. Most importantly, not all previous studies have reported the same gender specificity in omega-3 uptake seen in this study. So what does this mean for you? Should men be getting more omega-3 fatty acids in their diet than women, as the authors suggested? That is an intriguing idea, but based on the weaknesses I described above, I think it’s premature to make this kind of recommendation until these results have been confirmed by larger studies. It was a very small study. Obviously, it needs to be repeated with a much larger cohort of men and women. The idea that men and women may differ in their needs for omega-3 fatty acids is intriguing, but based on the weaknesses described above, it is premature to make this kind of recommendation until the results of the current study have been confirmed by larger studies. this was very interesting, I find that the more Omegaguard I take the better I feel, less aches and pains (arthritis) still, my Dr. wants to put me on statin drugs, tried them once for about 3wks. and stopped, Told him I would rather die of a stroke than be in the pain those things caused in me. Being Diabetic I have to go in regularly for blood work, and it always seems to be a battle. And I am always told I take too much Vita E. I just reply: better to have too much than an amputation (not in my vocabulary and better not be in his) Am anxious to show him the Dr. letter for the new Blood Pressure supplement Shaklee has introduced. Thanks for all your articles. so good and informative. I usually emphasize sources of long chain omega-3 fatty acids because those are the ones most likely to be missing from the American diet. Most naturally occurring oils contain a mixture of omega-3, omega-6 and omega-9 fatty acids. Vegetable oils other than flaxseed and canola are the best source of omega-6 fatty acids, but also have omega-3 and omega-9. Olive and peanut oil are the best sources of omega-9, but also have omega-3 and omega-6. Flaxseed and canola oil are the best source of omega-3, but also have omega-6 and omega-9. Flaxseed oil is not magical, but it is a very healthy oil. What you should know is that vegetable oils such as flaxseed and canola contain short chain omega-3 fatty acids and the efficiency of conversion of those to the beneficial long chain fatty acids is around 10%. That means that you need about 25 grams of flaxseed oil to get the same health benefits that you would experience with 2 or 3 grams of fish oil. That’s OK if you are using a tablespoon or two of flaxseed oil as a salad dressing, but don’t count on much benefit from a flaxseed oil supplement.